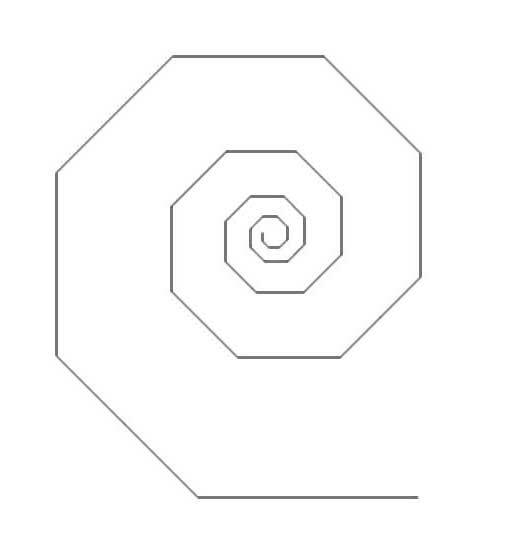 The general profile for a climbing cam lobe is an exponential spiral, also known as a logarithmic spiral. This curve has the unique property that the angle (psi) between its radial and tangential vectors (lines) is a constant everywhere along the curve. 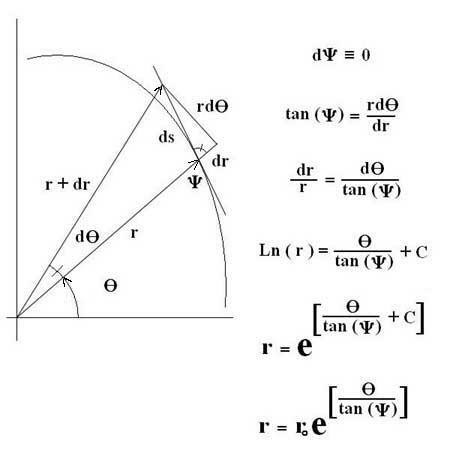 In other words, no matter how you rotate the curve about its center point, it will always have the same angular relationship to a given line. The only other curve with this property is a circle, which can be considered a special case of the exponential spiral, where the angle (psi) is 90 degrees, and the equation below reduces to r = constant. The exponential spiral can be readily derived from differential geometry using polar coordinates. Because the angle (psi) is a constant, it is possible to separate variables and obtain a solution to the differential equation, as shown below. 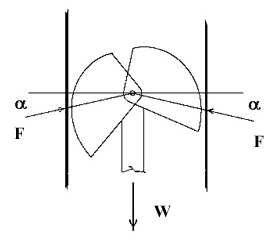 When the exponential spiral is used for a climbing cam lobe, the angle between the radial vector (line from the axle to the tangent contact point) and a vertical line (crack surface) is a constant. 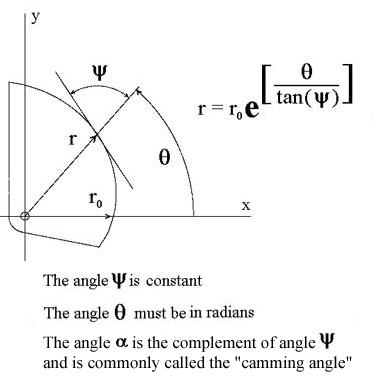 Another angle that remains constant is the so-called "camming angle" between the radial vector and a horizontal line. No matter how the lobe is rotated (to contract or expand the cam) the camming angle remains the same. Almost all climbing cams have a camming angle between 13.5 and 14 degrees. This angle has been found, over the years and by many different people, to have the best compromise between good holding power (small camming angle) and wide size range (big camming angle). A camming angle of 14 degrees has a slope of about 1-to-4 (the tangent of the camming angle is about 0.25). From the diagram, it is apparent that the shallow camming angle produces a high mechanical advantage. In this example, the ratio of H to V is exactly four-to-one. For every pound of downward force V at the axle hole of a lobe, there is a horizontal force H there equal to four pounds. The constant camming angle means that the 4-to-1 force ratio remains constant for all cam lobe positions. The contact force F between the lobe and the rock surface is the vector sum of V and H and is equal to 4.123 pounds. 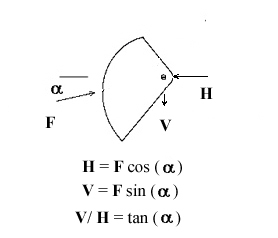 The contact force F at the rock can be resolved into vertical and horizontal components (not shown), which are exactly equal to V and H. At the rock surface, the friction force keeping the lobe from sliding down is equal to V, and the outward push of the lobe against the crack is equal to H.
The friction force V that prevents the lobe from sliding down is equal to the force H times a friction coefficient. If the friction coefficient between the lobe and the rock is greater than 0.25, or 1/4, the cam will not slide. If the friction coefficient is less than 0.25, it will slide. The friction coefficient between aluminum alloy and smooth granite is around 0.5, which implies that an aluminum alloy climbing cam with a camming angle of ratio of 4-to1 (typical for many brands and sizes) may be used as a secure anchor in a smooth granite crack - a conclusion that over 35 years of evidence has proven to be correct. For a multi-lobed camming device (like the majority of climbing cams) opposing lobes act against each other, and the horizontal force components H cancel out. The upward force components add together, balancing the force W pulling down on the stem. When there are four lobes, they each provide an average vertical force of one-fourth of the downward load W on the stem, or V = W / 4. But, there is a constant 4-to-1 ratio between H and V, so H = W. The four horizontal force components H act in opposing pairs, on opposite sides of the crack. So, the net horizontal force pushing the crack open is equal to twice the load on the stem, or 2W. This is useful to keep in mind if you are using climbing cams behind expanding flakes: if you hang on the cam, a force equal to twice your weight pushes the crack open. The force multiplying effect of a climbing cam in a crack means that the harder the stem of the cam is pulled, the tighter it grips the rock. The same load trying to pull the cam out of the crack actually locks it securely in place. A properly designed cam will break (or deform severely) before it will pull out of a crack, or pull out of a steel testing frame. A little oil on the testing frame, however, reduces the friction coefficient enough that a cam may slide out, instead of locking up. Water has a similar effect on rock, especially very smooth, glacier-polished granite. Wet rock does not hold cams as well as dry rock, but the friction coefficient of even wet rock is enough to keep them from sliding out. Ice, however, is very slippery and relying on friction to hold climbing cams in icy cracks is very dangerous. Cracks covered in wet mossy slime, or wet clay, are also slippery and will not provide secure cam placements. 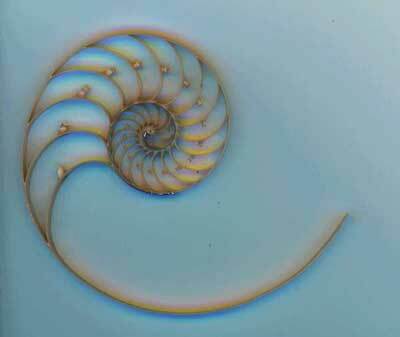 A slice through the shell of a chambered nautilus, Nautilus pompilius, shows it to be a nearly perfect equiangular, exponential spiral. Even the interior, curved ribs are exponential spirals, and their spacing increases in an exponential fashion. The shape is generated by the animal as it grows its shell, by maintaining a fixed angular relationship of new growth to existing shell. Each portion of new growth is larger than the last by a constant scaling factor. It is possible to approximate an exponential spiral by assembling line segments together, end to end, such that there is a constant angular relationship between connecting segments. The length of any segment is a constant multiple of the previous one. This sort of progression scheme relies on only two simple rules for completely determining the next piece: a constant angle, and a constant multiple of the last piece. The DNA cues that control the biological growth of the nautilus shell above are probably based on a similar, simple scheme of very few rules. This "spiragon" was constructed by using a constant multiplying factor of 1.1 to determine the length of each segment, based on the previous one's length. It's straightforward to demonstrate that the distances between parallel segments also differ by a constant multiple. The radii of points on an exponential spiral spaced 360 degrees (2-pi) apart also differ from their neighbors by a constant multiple. Hence, this spiragon is a close analogue to an exponential spiral.